As this is an open forum, any number of existing members may stop by your thread to give their input and advice. In fact, it's welcomed and encouraged, as this is a community we've created for the intelligent sharing of quality methods to work with digital media -- be it digital photography, digital video (DVDs, streaming, etc), digital content and design (be it web development or print media), and related topics. And we do, in fact, have quite a few skilled members here that are willing to share what they know. At digitalFAQ.com, our first priority is our customers. 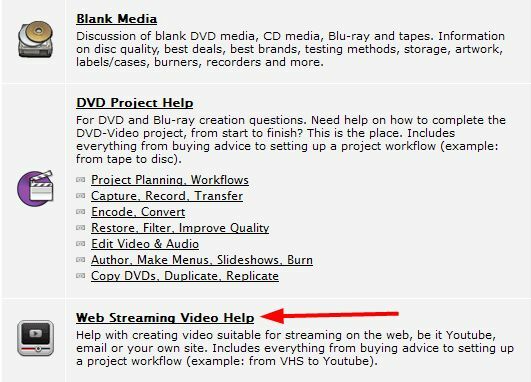 Whether we're converting VHS tapes, building websites, or consulting in the forums, our clients can rest easy knowing that they'll be well cared for. Free Members are answered on a "time available" basis. Your question may be answered after only a few minutes, or it may be answered after several days have passed. It just depends on our schedule and project queue. At some point, however, we will get to your question. For a faster and a more thoroughly detailed answer, consider becoming a Premium Member. Note that there are times when site staff may answer a Free Member question quickly, or even at great length, which is done at our discretion -- usually because we feel the topic adds something to the site and will serve to benefit many of our other members and readers. Current "site staff" includes: kpmedia, admin, lordsmurf, and LCP. Regardless of whether you get a response from a Free Member, Premium Member or Site Staffer, you're likely to get great info and advice. NOTE: Want help from a specific member? Ask! A number of people found The Digital FAQ through the posts made by our members at other sites/forums, such as Site Staff members lordsmurf or kpmedia, and would like to continue receiving advice from that specific person. This is perfectly fine. Simply write that into your post (i.e., "Can lordsmurf answer this for me?"). If the person is not a Site Staff member, then be sure to PM (private message) them, too. You do NOT need to PM Site Staff -- we already have an alert system in place. This is not to say, however, that others are not allowed or will not give their own suggestions -- it's just a request in addition to the video/tech/design/media question itself. The Digital FAQ forum uses a standard forum (bulletin board, user community) type of interface, as found on many sites online. In order to ask questions on the forum, or reply to other members, you'll need to become a member yourself. When registering for the site, be sure to follow all of the instructions -- what few there are -- including checking your email for the sign-up activation/verification link. You must click that link before you're able to make new posts for the first time. (Note that this is a one-time thing; you won't have to verify yourself each time you want to make a new post.) After you've signed up and verified yourself, go ahead and login. On the new post page -- which is the same page used for making new threads or new replies -- you'll enter a quality descriptive title, your detailed message, a few keywords that best describe your post (aka "Tags"), and then you'll post it ("Submit New Thread"). And then it will be answered based on the priority schedule discussed in the post above this one. -- a.k.a. -- The first post of this thread, as written by me (the OP) a few years ago. This also serves as an excellent example of when it's appropriate to bump old posts. I'm adding something useful! 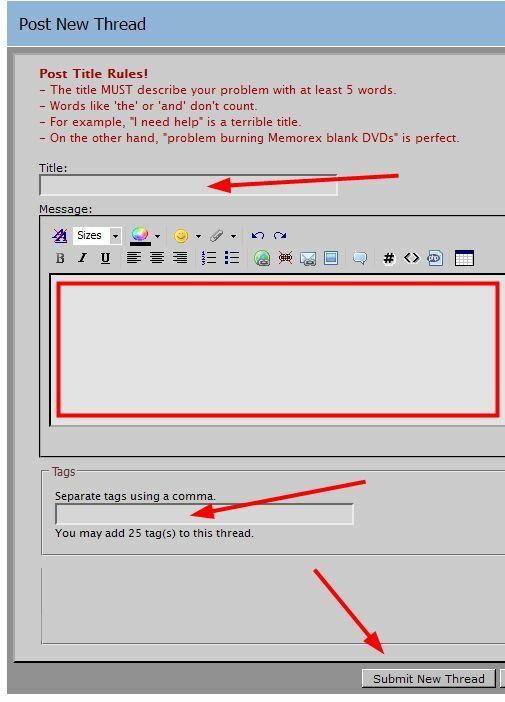 I hope this quick guide on using a forum has helped you! I know we've had a few people write in lately, confused on how to make new posts.